Malaria is one of the leading causes of death and morbidity worldwide, especially in the developing world. Malaria is an infectious disease that, despite being preventable and treatable, threatens the lives of 3.4 billion people around the world. Every year the disease accounts for over 580,000 deaths, the majority of which are in sub-Saharan Africa where a child dies every minute from malaria. Pregnant women and children under five years of age are especially vulnerable – high maternal mortality, low birth weight and maternal anaemia are other consequences of this devastating disease. In 2013, there were 97 countries that had some degree of malaria transmission. The toll on children under five has been especially devastating, accounting for 77 percent of all malaria deaths. In the continued fight against malaria, there is an increased recognition of the need to tailor interventions to suit specific situations and local needs. For the 25 million children aged 3-59 months who live across the Sahel, where malaria incidence increases with the rainy season, the World Health Organisation recommends seasonal malaria chemoprevention (SMC) as an effective tool to prevent malaria. Giving effective malaria treatment at monthly intervals during the rainy season has demonstrated efficacy in reducing cases of malaria by 75%. If this level of prevention is achieved at scale, this would transform the lives of those avoiding infection, reduce the demand for treatments at community and facility level, improve school attendance, and decrease government expenditure on malaria, making those funds available for productive reinvestment elsewhere. Early childhood development remains the key to a healthy nation with increased economic outputs in supported countries. Seasonal Malaria Chemoprevention (SMC) is a relatively new, highly effective intervention to prevent malaria in children under five – those most vulnerable to the disease’s effects. SMC involves administering up to four monthly doses of antimalarial drugs to children aged 3 to 59 months during peak malaria transmission season. Since it was approved by the WHO in 2012, SMC has been found to prevent up to 75% of malaria cases. It can be implemented in areas where most malaria transmission falls seasonally within a short rainy season and where resistance to the SMC drugs is low. 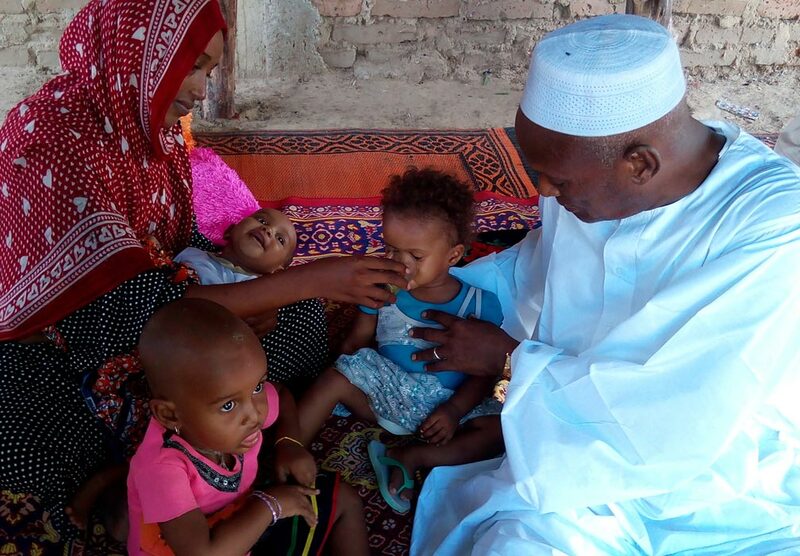 Some 23.7m children are eligible for SMC, the vast majority of who live in the Sahel region. For further information on Seasonal Malaria Chemoprevention, including implementation methodologies, impact, and its coverage in the media, see About SMC. Countries do not yet have the systems in place to distribute SMC drugs and administer them to children, including trained staff, logistics, tools, plans and communications materials. How will ACCESS-SMC address the existing barriers to implementation? ACCESS-SMC is working to address these five barriers, and so dramatically increase the number of children receiving this lifesaving intervention. Taking a market shaping approach, we are working to overcome bottlenecks to both supply of, and demand for, SMC drugs and to improve information flows between the two. This innovative approach will directly lead to 6.6m children receiving SMC by 2016, while acting as a catalyst towards ensuring that SMC reaches all 23.7 million eligible children. Administer SMC services to up to 6.6 million children in seven countries. We are putting in place systems and providing technical and financial support to administer SMC at scale in Burkina Faso, Chad, Guinea, Mali, Niger, Nigeria and The Gambia. For further information, see Implementing SMC at Scale. Stimulate increased global interest and capacity among manufacturers for quality assured SMC products. ACCESS-SMC is working with current and potential new manufacturers of SMC drugs to increase the volumes of SMC drugs being produced, the number of suppliers of those drugs, and to develop new formulations of SMC drugs which are easier to administer. For further information Increasing Global SMC Drug Production. Use learning from implementation to improve efficiency of SMC delivery. We are working across all seven countries to strengthen evidence and analysis around the delivery costs of SMC. This evidence will drive efficiency improvements in future rounds of SMC delivery, and give donors, health ministries and the private sector the evidence and tools to plan and deliver SMC more predictably and efficiently. For further information, see Improving Efficiency of SMC Delivery. Demonstrate the safety and efficacy of SMC when delivered at scale. 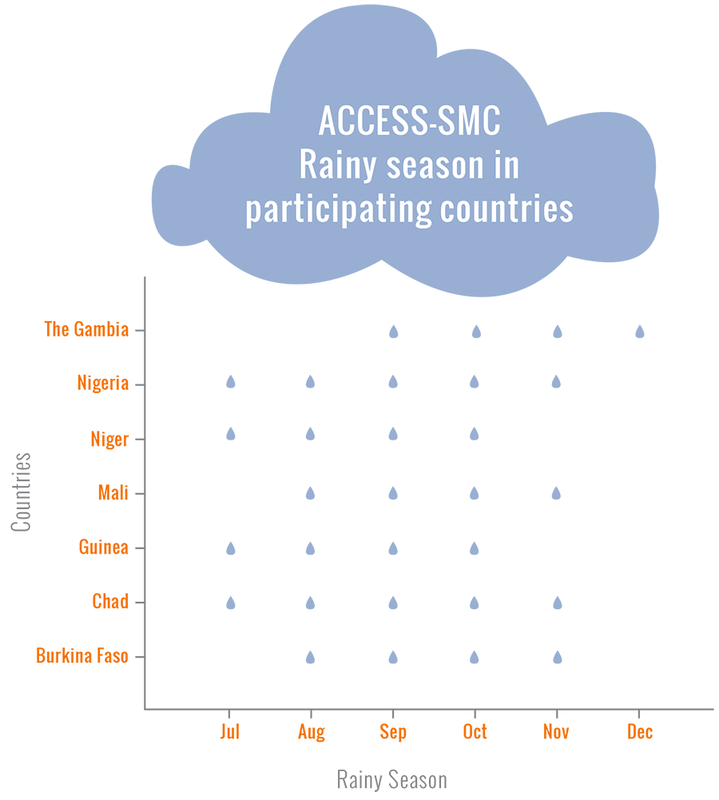 ACCESS-SMC is working to assess the impact of SMC on malaria cases during the rainy season in each of our seven supported countries. We are also supporting systems to identify and manage adverse drug reactions, and to monitor for resistance to the current SMC drugs. For further information, see Demonstrating Effectiveness and Safety. Accelerate creation of sustainable, funded demand for SMC. Getting lifesaving SMC drugs to all eligible children means mobilising the support of a great range of stakeholders. ACCESS-SMC is engaging health ministries, donors, the private sector and communities to push for the resources to expand access to SMC services – both now, and in the future. For further information, see Mobilizing Further Resources for SMC. The need to identify, train, supervise and reimburse the (typically volunteer) community health workers who deliver SMC to the children. The need to ensure efficient and transparent supply chain management, which ensures that SMC drugs are available at the point of distribution in time for administration at the most challenging time of year – the rainy season. ACCESS-SMC is working with all seven supported National Malaria Control Programs (NMCPs) to create SMC delivery pathways. We are providing support in a range of areas, including planning and management, supply chain, health worker training and communications and social mobilization. The project is also procuring almost 15m doses of SMC drugs in 2015, and up to 30m in 2016. Working together with NMCPs, we will reach 3.3m children in 2015 and up to 6.6m children by 2016 in Burkina Faso, Chad, Guinea, Mali, Niger, Nigeria and The Gambia. For further information on how SMC is delivered see About SMC. To learn about country specific plans, click here. An estimated 80% of SMC’s cost is thought to be incurred in delivery, with cost drivers including health worker training and payment, drug transportation and storage, and planning. These cost drivers can give the impression that SMC is a costly intervention. There is however, limited documented experience and evidence around the costs of SMC delivery, meaning that there is significant scope for analysis and achievement of efficiency gains in SMC delivery. ACCESS-SMC is working to document and analyze the costs of delivering SMC, and use this analysis to feed into improved efficiency. We are developing a standardized costing tool, with costing categories (such as capacity building, coordination, and supply chain) comparable between countries and contexts. The tool will be used to analyze actual costs of implementation, leading to increased efficiency and delivery cost reductions in future years. Costing model: ACCESS-SMC is developing a costing model which will capture the cost of SMC both to the health system and donors, with a range of cost categories to enable costs to be compared by country. The model will be populated with real implementation costs each year, following a costing survey (see below). Costing survey: ACCESS-SMC will carry out an annual costing survey in each of the seven supported countries, with a view to capturing the costs – both to the project and to the health system – of delivering SMC. We will then analyze this data, to assess areas where changes can be made to future implementation to increase efficiency and lower delivery costs while maintaining quality. We will publish key findings of this study to inform improvements in other SMC programs. With evidence of the cost drivers for SMC distribution, and demonstrated experience of how they can be reduced, this work will also inform the mobilizing of further resources for SMC. For drug manufacturers to invest in increasing their capacity – and for health ministries and donors to invest in rolling out SMC – it is crucial that there is confidence in the effectiveness and safety of SMC drugs. Yet, in many countries, systems to monitor adverse drug reactions (pharmacovigilance systems) are extremely fragile, neither identifying and managing adverse effects, nor reporting them to the relevant authorities. While SMC has been demonstrated as highly effective in initial implementation, this will be the first roll-out of SMC on this scale. Rigorous data is required to demonstrate that the public health impact of SMC when implemented at scale is as high as in pilot implementation. Similarly, it is not known how quickly resistance will develop to the SMC drugs when rolled-out repeatedly over a large scale – critical if SMC is to be an intervention for the long term. ACCESS-SMC will demonstrate the public health impact, long term efficacy and safety of SMC drugs through a range of technical support, surveillance and surveys. We are also working to strengthen the pharmacovigilance system in each of the seven countries to ensure patient safety during the administration of SMC to 3.3m children in 2015. By demonstrating the impact of SMC on malaria cases, plus the drug’s long term efficacy and safety, we will assure drug manufacturers that there is a long-term market and a business case to increase global SMC drug production. We will also show health ministries, donors and the private sector that SMC is a long-term intervention worthy of investment, helping to mobilize further resources for SMC. Targeted technical assistance to each country’s pharmacovigilance agency. We are training community health workers, health facility workers and other health officials, and ensuring that reporting systems are functional and that reporting is completed. Conducting a Cohort Event Monitoring study, whereby a cohort of children are assessed one week after each SMC cycle to detect mild and moderate side effects which may not be reported to the health facility. Monitoring at sentinel sites in each country. This will supplement other health system data, together demonstrating the impact of SMC in reducing malaria related death and illness. Monitoring the development of resistance to SMC drugs by the coverage scale up. This will be carried out through molecular marker surveys in all participating countries and case control studies in selected countries. The evidence provided by these studies will be critical in proving that SMC using SP+AQ is a safe intervention with a long life span, consequently helping to mobilize resources for SMC, while giving drug manufacturers the confidence to invest in increasing global SMC drug production. While SMC has received considerable attention and been well received among health stakeholders, information and knowledge gaps prevent health ministries and donors taking decisions to invest based on hard evidence. These gaps include the costs of delivery, at-scale safety and effectiveness, and the knock-on effect of SMC on demand for malaria treatment services. ACCESS-SMC is working to generate evidence and experience around all of these areas, but needs to engage with donors and governments to support them to allocate resources. ACCESS-SMC can only act as a catalyst to greater coverage if the learning, evidence and resources we generate are shared with others. For this reason, we have a strong advocacy and resource mobilization component – helping ensure that governments source funding early to continue implementing SMC in project districts once ACCESS-SMC closes and to continue with further expansion. This area of work brings together evidence and experience from each of the other four areas to advocate to funders and governments to allocate resources to sustain and expand SMC coverage. ACCESS-SMC will share evidence generated by the project to make the case for SMC as effective, long term intervention to prevent malaria deaths and illness. This will include publishing findings of costing surveys, safety and efficacy profiles, and the public health impact of SMC in target countries. ACCESS-SMC will organize planning and lesson learning workshops and events in each of the countries, bringing together a wide range of stakeholders from government, implementers and funders to jointly plan how SMC implementation can be expanded and improved. A key component within this is to ensure that country implementation plans developed as part of the Implementing SMC at Scale component are specific, realistic and accurately costed, giving funders confidence in their viability. Finding continued funding to maintain such a large scale up of coverage will require advanced planning. Early in the project, ACCESS-SMC will work with NMCPs to develop a transition plan, helping countries move from project funding to other sources. In each country, we will provide support to analyze the costs of maintaining and expanding SMC coverage beyond the project (using the costing model developed in improve efficiency of SMC delivery). Our country teams will then work with NMCPs to find funding and resources from government, donor and the private sector sources. ACCESS-SMC will develop a user-friendly, customizable tool to model the effects of SMC coverage on the need for malaria control interventions. This will help countries make policy and investment decisions around SMC understanding the effect it will have on other aspects of their health system. SMC coverage can only be expanded if drug production volumes can meet this additional demand. Yet there are a number of structural issues affecting the global marketplace for SMC drugs. Manufacturers have little information on SMC drug demand in advance, as there is inadequate coordination and planning by SMC implementers. In the long term, this makes it difficult for manufacturers to evaluate investment in increasing production. There is currently a single supplier of quality assured SMC products leading to uncompetitive pricing for quality assured SMC drugs – yet the significant cost of developing and registering new drugs deters other manufacturers from this niche drug market. The current SMC drug formulation is also inadequate. In its current formulation, health workers need to crush the tablets before administering to the child. This leads to an estimated 15% wastage of drugs. The bitter taste also means that children frequently spit the drugs out. The formulation means health workers need sugar, spoons and plastic bags – adding to the cost and logistical challenges. There is a clear need not only to increase global production, but also to improve the formulations which are produced in order to Improve Efficiency of SMC Delivery. ACCESS-SMC will transform the functioning of the market for SMC products, providing SMC drug manufacturers with information on funded demand for products and enabling them to take informed decisions on scaling up production. The project will make the market more competitive by helping new manufacturers to bring SMC drug products to market – particularly focusing on new dispersible SMC drug formulations which are easier to administer and more palatable to children. ACCESS-SMC will develop a demand forecasting tool, collecting information in SMC implementation intentions and funding from supported and non-supported countries. In supported countries, we will also help NMCP’s to develop logistically feasible, accurately costed and funded SMC plans – increasing the accuracy and credibility of their need for SMC products to manufacturers. Information on demand will be made available to manufacturers of SMC products, helping them to plan for the scale-up of production over the coming years. ACCESS-SMC will provide a package of support for the research, development and bringing to market of new SMC drugs. Importantly, these will be in a dispersible formulation, ensuring that expansion of the SMC drug market raises the bar improving SMC service delivery. By increasing global production of SMC drugs – and improving formulation – we are not only facilitating expansion of SMC coverage (see Implementing SMC at Scale) but also helping to Improve Efficiency of SMC Delivery.